We mostly know the word jujube from having snacks as a kid in the movie theatre. Jujubes were once unchewable resinous candies of many flavors, and then were changed to something akin to gummy bears. Jujubes are a general term for a variety of candies in many countries. Oddly enough, and for reasons I know not, there is a tree called a jujube that bears wonderful fruit. 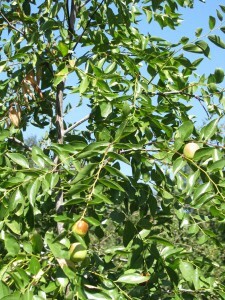 Jujube tree with fruit (a drupe, actually) ready to pick. 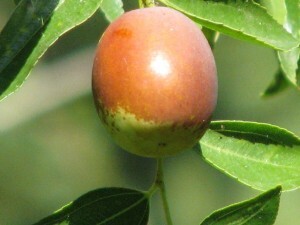 Jujube trees (Ziziphus jujuba) have been cultivated in China for over four thousand years, and are gradually catching on in other countries. The first jujube fruit I ate was last year in a dried form. It was good, faintly reminiscent of a date. Now I have a tree that has just begun to bear fruit, and I am in love with it. The fruit is small, like very large olives. They begin green and then quickly turn to a reddish brown color, usually in blotches of color. The fruit turns brown in patches, but can be eaten before completely dark. You can eat them fresh; in fact, I haven’t had them cooked yet. They are delightful. There is a center stone, such as in a date, but it holds two seeds. Thin skin, crisp flesh like a green apple with a hint of date. The skin is thin and tender. The flesh is crisp and reminiscent of a green apple with hints of date. I love them. Many wait until the skin begins to wrinkle to eat them. You may pick the jujubes as they start turning color and they ripen quickly in the house without loss of flavor, or let them dry on the tree. 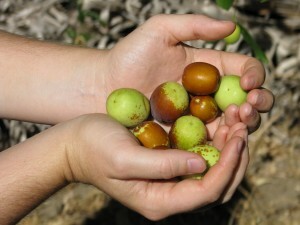 Jujubes are high in vitamin C, and have been used medicinally in other countries, especially as a tea for sore throat. Best of all, so far the local birds ignore them, and there don’t seem to be any insect pests that love them. 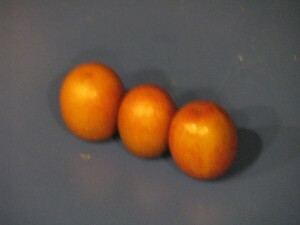 Jujubes are a lovely reddish brown when ripe, and darken as they wrinkle. What makes the jujube a wonder tree is that it doesn’t seem to mind intense heat; in fact, it loves full sunshine and dry conditions. It also can survive a chill factor down to -28 degrees F! It doesn’t mind clay or alkaline soils, although good drainage and regular watering insures a good crop. They require little or no fertilization. There are many cultivars, the best being from China and more inferior ones from India and Japan. Many are thorny but some are virtually thornless. The trees can grow 30 feet high, have an attractive drooping appearance and are deciduous, the leaves yellowing before dropping. Suckers can appear several feet away from the trunk and can be controlled by mowing or pruning. You can read more about this remarkable tree here. Why not try a jujube tree? They provide food, windbreak, mulch and have a very hard wood, and take just about any conditions. And the next time you go to a movie theatre you can bring your own jujubes… dried! 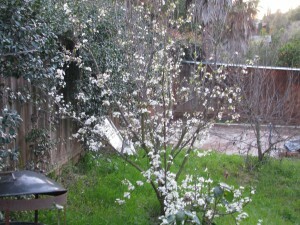 We have two small but prolific kumquat trees. 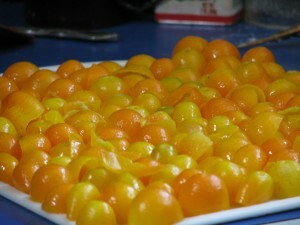 Kumquats are very small citrus that are tart and sweet at the same time, and you eat the skin and all whole. Kind of scary. Not wanting to waste food, my daughter picked a whole batch of them and was determined to juice them. And she did, one tiny half at a time! There was about half a cup of juice in all, which she froze in plastic butter molds for future use in drinks, etc. Then we had all these little half shells, so she carefully scraped the pith out of all of them and candied them. The idea was to make little candied shells in which we’d put little scoops of vanilla ice cream, lemon sherbet, or something yum. We tried a couple with homemade vanilla ice cream, and it was worth all the work. 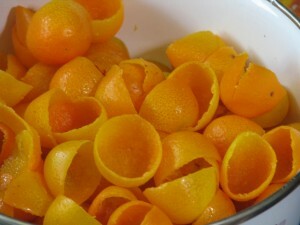 The kumquats needed to dry round, like little bowls, so I picked some more kumquats (yes, there are still more! ), halved them and used them as molds for the shells, which were put onto the halves like little hats. All the split ones were set aside, and then everything was sugared and dried. Several years ago we candied orange and lemon peel and I pulled some out of the bags now and then for use in baked goods. 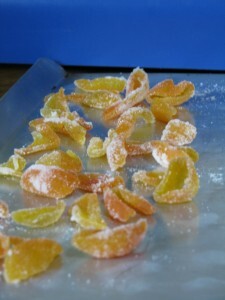 Now we have candied kumquat peels and shells. But we still had all those kumquat halves that we’d used as molds. 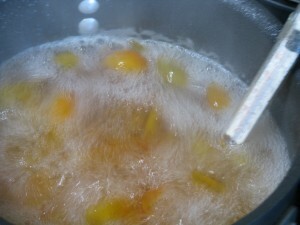 We also had half a saucepan of simple syrup in which the kumquats had been cooked. 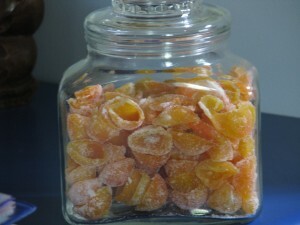 So, not wanting to waste, we put the kumquat halves into the syrup and boiled it again until the halves were candied and then I put them in jars and sealed them. I’m not sure what I’m going to do with them, but they can be used to decorate desserts. I also had another ginger beer recipe that called for slicing the ginger, cooking the slices in a sugar and water mixture until reduced, then using the liquid as a base for a ginger drink. The slices could then be sugared and dried and eaten. I keep candied ginger from Trader Joe’s in the car to snack on, because ginger helps with car sickness or an upset stomach. These homemade ginger slices were quite hot, so I think I’ll save them to use in cakes and pies instead. So it was a day of sugaring, preserving and messing about in the kitchen. We now have seven quarts of pickles, a couple of bags of dried kale that is not only good to munch on, but great to crumble over rice or noodles, jars of candied kumquats, a jar of sugared kumquat peel, a bag of candied ginger slices, some miscellaneous jam, and lots of zucchini with more to come! Today I really felt that Southern California had shrugged off Winter. 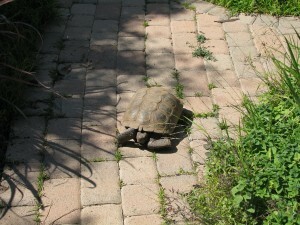 It was warm and a little humid out, my Satsuma plum is in full bloom, and my desert tortoise (endangered species; I’m his third owner and he’s licensed) Homer came out of hibernation in the closet. He’s still sleepy and grumpy, and I can relate to that. 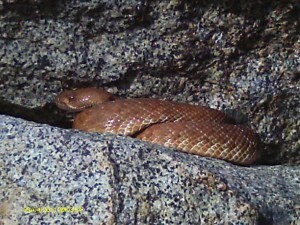 I also saw the first Red Diamondback Rattlesnake today, newly emerged from hibernation, sunning itself in the cleft of a boulder about head height. My hiking buddy Alex and I were at Santa Margarita River Preserve, and there was this somnamulant reptile soaking in the sun and enjoying the radiating warmth of the rock. We posed right next to him or her, and he or she didn’t care. This would not be the case on a hot summer’s day! 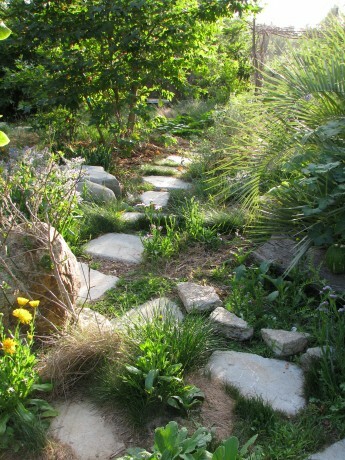 This intermediate dry spell is important for the construction of the permaculture garden because the soil is still too wet to allow trucks down on the property. We are investigating the best way to create the ponds, which at this time will incorporate a dry rock creekbed that will catch and channel rainwater and allow it to perculate into the soil, another pond for water holding, and a possible natural swimming pond. The swimming pond works on the same concept as a natural greywater system. Beside the swimming area is another deep area filled with different grades of rock. Water plants which clean water with their roots are planted on top in a naturalistic way. Water is pumped into this area from the bottom, and as the water rises through the gravel and plant roots it becomes clear, then is transported into the swimming area. No chemicals needed; in fact, chemicals would ruin the biological balance of the pond. The swimming pond is clean and ready for human use, and also provides riparian habitat, food and acts as a watering hole for many animals. They are popular in Europe and other countries, and are slowly catching on here in America. Of course, people throughout time have swum in gunky swimming ponds; this is just making one for oneself. This is a YouTube link to a UK pond builder. He is hawking a video on his project, which is only available in the UK and thus wouldn’t play on US DVD players, but this short video tells a lot about swimming ponds: http://www.youtube.com/watch?v=7JoQthEBl6U . Clicking on this link will navigate you away from this page. I just love his Liverpudlian accent. Today I became the owner of clumping giant bamboo, and a Buddha’s Hand citron. So very cool! 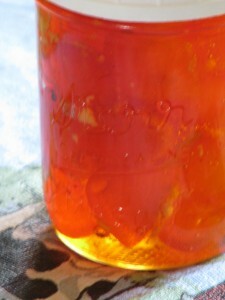 The bamboo can be used for all kinds of structures, and with the citron I can make my own candied fruit for desserts. 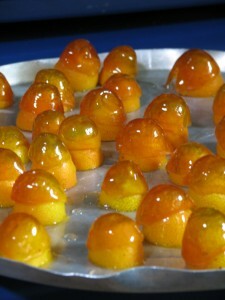 Did you know that candied fruit is called succade? Nope, neither did I.
Creepy, but fun and very fragrant. 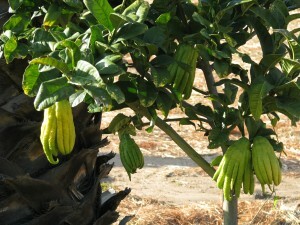 The fruits are mostly peel, and are used to scent rooms and clothes in Asia. Also planted were various stonefruits, including 4-in-1 apples, apricot, cherry, pear, peaches, nectarines and Asian pear. I also became the proud owner of two little kumquat trees. They are loaded with fruit, and since they were purchased from an organic nursery, this crop doesn’t have to go to waste (you eat kumquats whole). 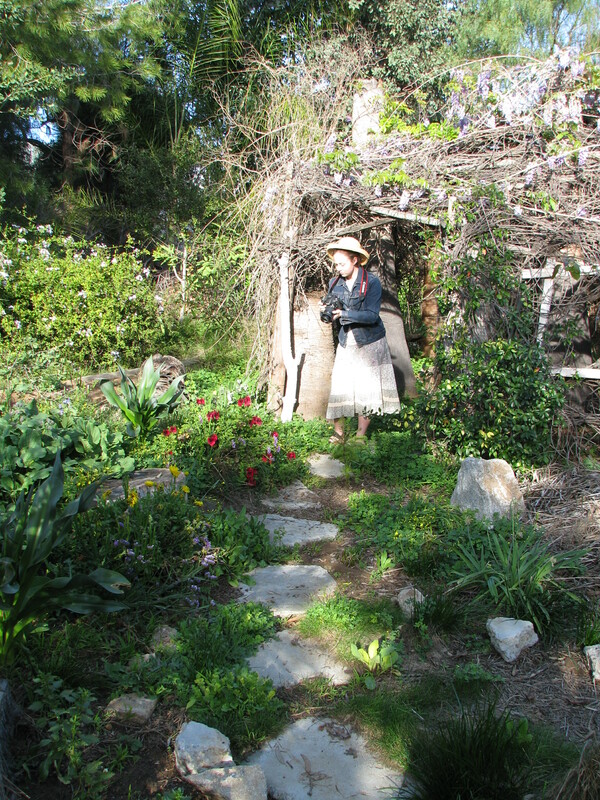 So, after a morning of Zumba at the Fallbrook Community Center, planting and feeding my many animals, then four hours of intense hiking, my legs are trying to get me to walk upstairs to bed and stay there. Sounds like a good idea to me. When I look outside at the over 100 degree F. sunshine baking my property, I’m frustrated that I can’t use it all. I feel the same when it rains here in semi-desert San Diego county. I am hoping to purchase solar panels for my house, but until then I have my laundry on the line and fruit on the roof. Yep. The bounty of fruit and vegetables always appears during the hottest months, and I’ve spent many summers sweltering in the kitchen cooking jam and canning tomatoes. Something in my Celtic and Eastern European genes ignores the long growing season here and sends a message to my brain to preserve everything for the coming harsh winter imbedded in my genetic memory. Survival food for the blizzardy months! Um… yeah… reality check here. Although I try to eat locally grown seasonal produce, you can buy just about anything anytime of year here, although not without a decline in the quality. To give in to my desire to not waste sun energy or food this summer I’ve been slicing and drying fruit and vegetables on trays up on the roof, with excellent results. If you have a flat sunny spot that ants haven’t found, you too can dry food. You don’t need to use preservatives. It is a great way to save bananas that are just about to go black, or the ends of the tomatoes that are too small to put on a sandwich. The most labor is in slicing the food and then later flipping it on the trays. Produce such as fresh apricots or other stonefruit, apples, pears, berries, tomatoes, squash. Thinly slice produce such as apricots, tomatoes, apples, bananas, etc. You don’t have to peel stone-fruit or tomatoes; actually the skin helps hold the innards together. If you have produce with inedible skins such as melon or bananas, then by all means take it off. I like small pieces so that the dried fruit can be directly used in baking or on top of fresh fruit or cereal without having to be cut up again. 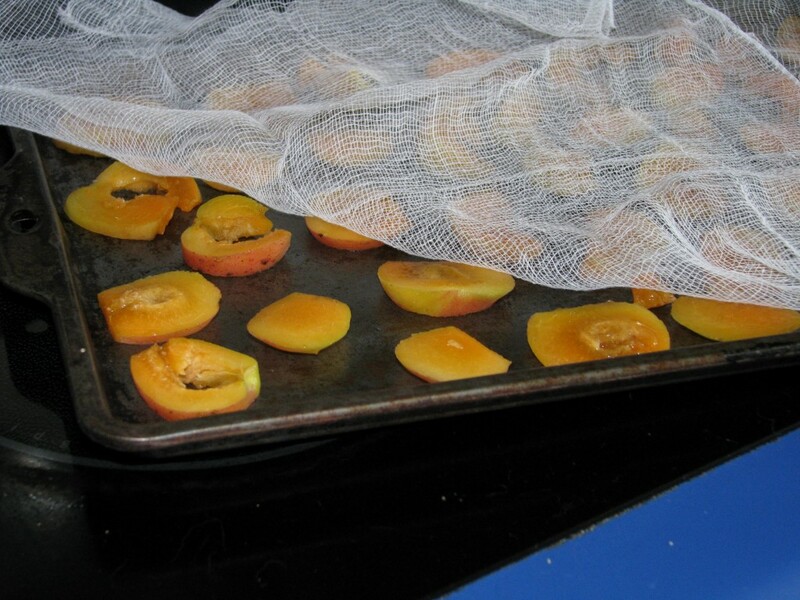 (Snipping dried apricots with a scissors is soooo time-consuming). 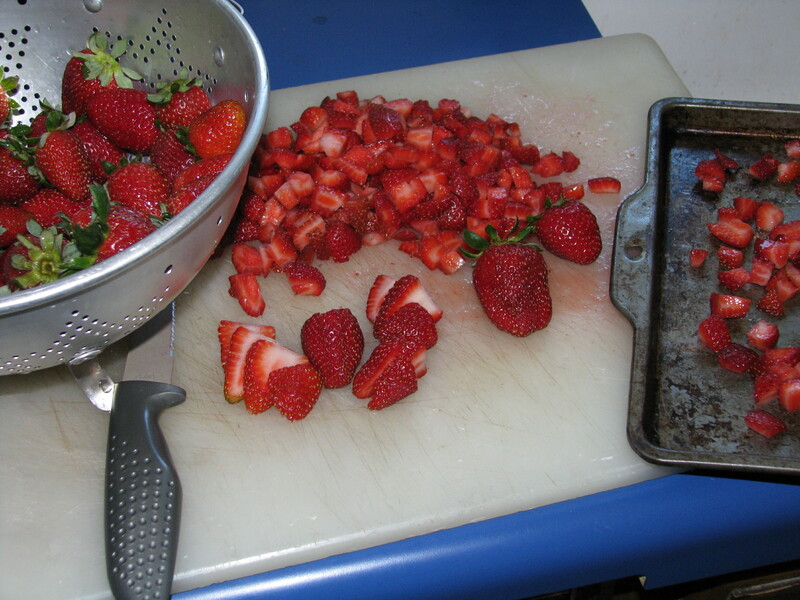 However, don’t slice them too small or when they dry they will turn into little dots which are hard to scrape up. You can leave small fruit such as blueberries and alpine strawberries whole but they may take longer to dry. Don't chop them too small! 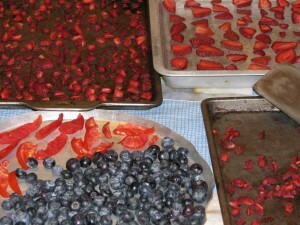 Place the sliced or whole fruit or vegetables on cookie sheets or pizza pans that are reflective aluminum. Space the fruit so that it isn’t touching, but the pieces can be very close together (they will shrink considerably). 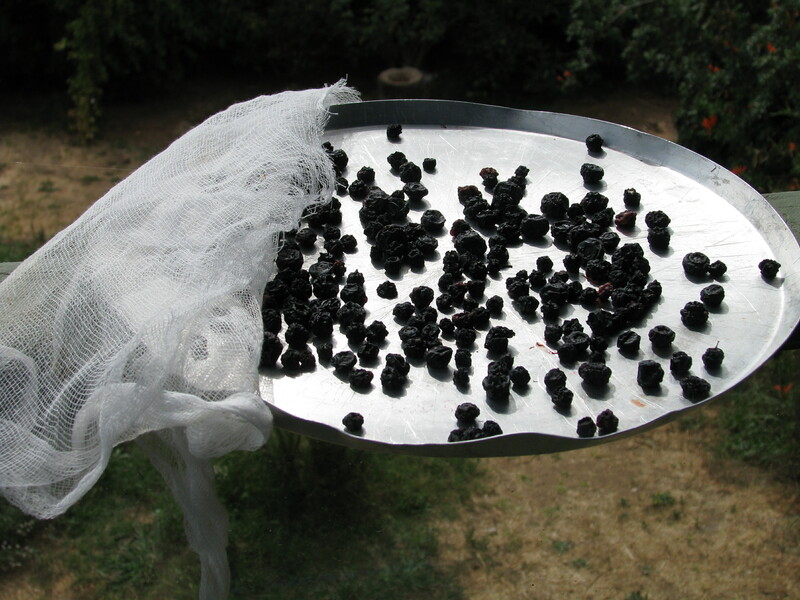 Measure pieces of cheesecloth so that there is enough to cover the tops of the trays and hang over the sides so that it can be pulled taught and not touch the fruit . Place prepared trays of covered fruit on the roof, on a hot porch, or anywhere it will not be invaded by ants. Leave the trays out all day until the sun is no longer on them, then bring them in for the night. Don’t leave them out in damp weather. Using a sharp spatula, scrape up the fruit bits and turn them over, re-spacing them not to touch, and replace the cheesecloth. The next day set the trays out again. 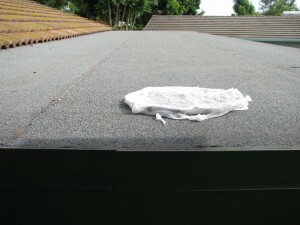 Depending on how hot your roof is, the fruit should be dried at the end of the second day. 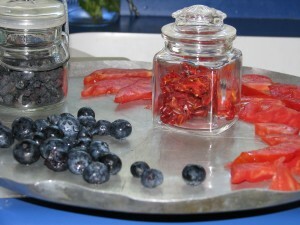 If using whole fruit like blueberries or grapes, it may take a few days. 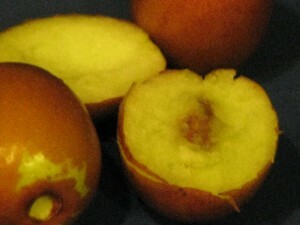 Fruit is dried when there are no moist pockets in them. Store the fruit in covered jars, and use during those bleak winter months when you plot your spring garden.